Delyth McLean, for many, was one of the highlights of this year’s Swn Festival and undoubtedly won over many new fans with her stunning performance (AfterDark clearly being one of them judging by our glowing review of her in our coverage of Swn). You can never underestimate Swn’s power to catapult exciting Welsh artists into newfound public recognition, and Delyth is the latest in a long line of acts to emerge from that canon. The glowing response she received was made even more remarkable by the fact that she has only been performing as a solo artist for little over a year, and this was the very first gig done with her new band. The only disappointment came out of wanting to explore her back catalogue online immediately after her gig with all of the songs still ringing in my head well after, only to find none of them in as-yet-released form. The ‘hidden gem’ description has a very apt meaning here. Thankfully, myself and countless other fans, old and new, have her soon-to-be-released debut single to look forward to, the breathtaking Lost in Sound. This was recorded with in-demand songwriter extraordinaire Amy Wadge, who seems to add a golden touch to anything she lays her fingertips on, and is the first track to be taken from her forthcoming ‘Bi-Lingual’ EP (due for release early next year. I’ve had the privilege of getting an exclusive play of Lost in Sound ahead of its release, and it is as understatedly brilliant as you can come to expect from Miss McLean. In the singer’s own words, Lost in Sound emerged out of a breakup during which she lost her passion for music, until eventually her creative spirit was rekindled. The best, rawest music often comes out of the most cathartic experiences and Lost in Sound is testament to this. The emotional power and main hook of the track lies in her haunting falsetto vocals, which are given room to roam by the track’s bare instrumentation. Delyth’s magnetic voice and presence is an instrument in its own right and sets her apart from many others within the folk genre, and it is a weapon which she uses to full effect here. The serenity of the track is what makes it special, speaking loudly to the heart and soul without being loud. Lost in Sound is both a delightful culmination of all the hype Delyth has generated over the past year, and a vivid signpost to what looks set to be an exciting future ahead for the Welsh songbird. Lost in Sound will be available to buy and stream on Thursday 27 November. The track is taken from her ‘Bi-Lingual’ EP which will be out early next year. Shortly after her set at Swn Festival, AfterDark’s Dean Hodge managed to grab a quick few words with her to talk about what she made of her performance and her plans for next year. DEAN: What did you make of the experience playing at Swn Festival? DELYTH: It was fantastic. I couldn’t ask for more really. I didn’t expect so many people to turn up and see my set, and get such an amazing response – especially as I was playing as early as 2pm in the afternoon! DEAN: And this was the first time you played with the band? DELYTH: Yes, I’ve been rehearsing for only a month with the band up to now. Swn is such a big stage to be playing our first proper gig as a band together, but I’m really happy with how it went. I’ve been gigging on my own for only a year and a half now, so to be playing here is surreal and amazing. DEAN: Have you grown much more confident as a performer the more you’ve been playing on stage? DELYTH: Definitely! I wouldn’t be where I am now, or be able to have a band behind me, if I didn’t have the experience that I’ve gained from gigging relentlessly over the past year. DEAN: What are you plans for the next year, and are you releasing any new material soon? DELYTH: I’ve recorded a double A-side single with Amy Wadge which will be released later this month. Working with Amy Wadge has been an amazing experience. She’s been in the industry for so many years, and has so much musical knowledge. I feel like a sponge when I’m around her because I soak up so much knowledge and ideas from her. Plus, she’s a very kind person and a pleasure to work with. She’s written with people like Ed Sheeran and Lewis Watson so she has so many stories to tell. Today sees the full release of the full-length debut offering from acclaimed Welsh songwriter Maddie Jones, produced by Charlie Francis (who can add an impressive list of names to his resume including REM, Future of the Left and Sweet Baboo. Throughout the recording of the album, Maddie has additionally been mentored by Amy Wadge (songwriter for a number of other artists and the co-writer of Ed’s recent number one ballad Thinking Out Loud). So what did AfterDark’s Dean Hodge makes of ‘Vita Brevis’ below? It is a rare thing these days for an artist to be both an accomplished musician, a gifted singer and a naturally assured performer all in one, yet Maddie Jones ticks all those boxes and possesses the whole package. On listen of any of her impressive back catalogue, you certainly get a strong sense of her identity which pores through each of her songs, as does her eclectic range of musical influences. It is a reason why she has been hotly tipped by so many and why her debut collection ‘Vita Brevis’ (derived from the Latin for ‘life is short’) is eagerly anticipated, and on her full-length unveiling she justifies the hype in her own understated style. Opener Not Made for This is the perfect introduction. Built around the simple yet devastatingly effective vocal-and-guitar combo courtesy of Miss Jones, it is a work of minimal beauty. There’s a strong scent of a Jeff Buckley influence, and particularly the melody and gradual build-up certainly recaptures the mystical atmosphere of his tracks Mojo Pin and Opened Once. Indeed, the Buckley aura reverberates later in the album on the Dream Brother-inspired penultimate track Remnants which falls between the mystic, chiming folk yours truly and the melancholy-laden pop of Mazzy Star. Don’t Sit Still (formerly from her Mr Walrus EP) is built around a Nick Drake-inspired delicate, fingerplucking guitar melody which, coupled with MJ’s haunting vocals, is the perfect soundtrack to an autumnal, sunset-lit evening. She Was Young, the album’s lead single, then adds a jauntier vibe to proceedings with its appropriately themed lyrics that blend youthful naivety with wistful nostalgia. It is accompanied by a fittingly upliftingly jovial video (see below), filmed by Joe Marvelly in a little antiques shop called The Pumping Station and consisting of Maddie and co performing the track on cardboard instruments. The opening triple salvo of the album alone demonstrates just how effortlessly and gracefully Maddie can sift between a range of emotions and styles, all while delivered with her trademark soulful rasp . Throughout the rest of Vita Brevis, she continues to flex her vocal muscle and versatility, gliding between the aptly brittle melody of Glass, the swirling, seductive tones of Dirty Little Secrets (one of the cuts from her Let It Out EP), the bouncy jazz rhythm of What the Hell and the toe-tapping soul of More Fool You. It is on the more stripped-back offerings such as Glass and Know It All hat allow the full warmth of her voice to radiate. Maddie Jones is a true artist who can happily sift between influences and genres and refine them into her own sound. This is a diversely flavoured debut that shows the true versatility of Maddie as a musician, vocalist and writer. Maddie has stated that she always likes to have creative control over her recordings and it is a blessing as her personality is fully conveyed through her music. Yet under the guidance of producer Charlie Francis, her raw musicality has be honed into a collection of songs that are polished on the surface yet still harness the raw emotions and energy which each of the tracks exudes. On album closer Soon, she ends the album the way she started it with a vocal-and-guitar melody bare in its simplicity and beauty, which soars above divine harmonies in the background. It is the perfect final blow of a bright candle, and a stunning way to round off what is a remarkably, prematurely mature debut from the young songstress. To celebrate the release of ‘Vita Brevis’, Maddie Jones will be playing a launch gig for the album at The Moon Club in Cardiff on Thursday 13 November, with support from Kymo and Harri Davies. Tickets are £4 and available at the door on the night. More information available here. Read the full interview with Maddie Jones from AfterDark’s Dean Hodge below. DEAN: Can you tell me more about your debut album? 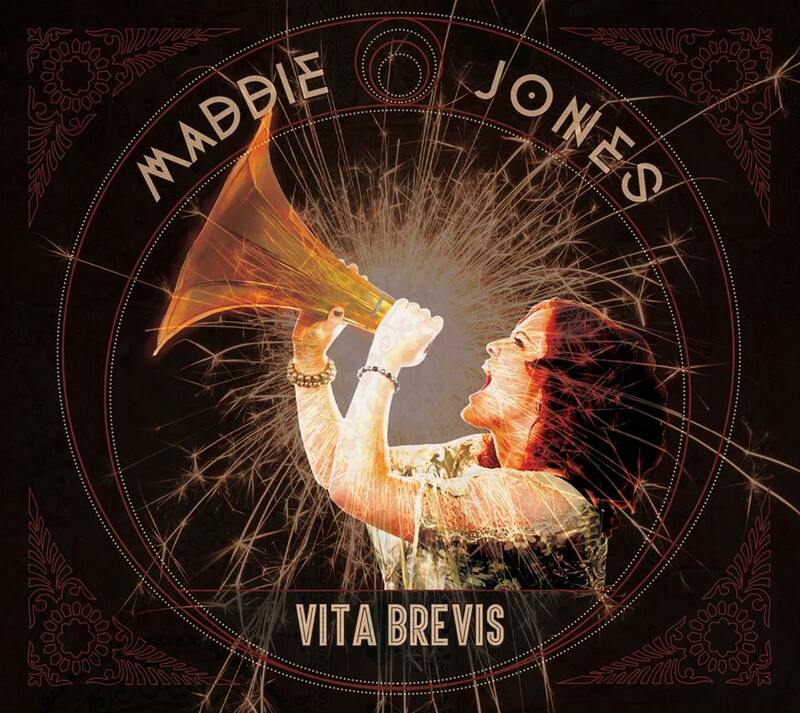 MADDIE: The name of the album ‘Vita Brevis’ comes from the Latin phrase ‘Life is short’. I recorded the whole album with a producer called Charlie Francis who has worked with the likes of REM, Future of the Left, and Sweet Baboo to name but a few. Recording the album was very different to how I recorded before. Whereas before I would normally take charge of every single element of the recording process, while I still wanted my own creative control Charlie played much of a guiding role as opposed to just recording. I allowed him to take more charge and we made decisions together on the overall sound and feel we wanted for the album. Before I recorded the album, I worked with Amy Wadge. The sessions involved playing through my songs and working out which were the strongest, as well as coming up with ideas such as how to make my voice more of an instrument on the songs and adding more backing vocals. DEAN: For the lead single ‘She Was Young’, you look like you had a lot of fun making the video. Where did you film the clip? MADDIE: The video was certainly a lot funnier then we intended it to be! We made cardboard instruments and filmed the video in an antiques place called The Pumping Station. The video consist mostly of me just running around the place playing with all the antiques, along with footage of our actual rehearsal for the upcoming launch gig. DEAN: You have a very eclectic musical sound and a diverse range of influences. Who would you say were perhaps the main artists that first inspired you to take up music? MADDIE: I went through lots of phrases really. I used to like a lot of jazz singers such as Billie Holiday, then I went through a rock phase and was a big fan of bands such as Red Hot Chili Peppers and Queen. I didn’t really start listening to other singer-songwriters until more recently and I still don’t tend to listen to that many, though I’m a huge fan of Jeff Buckley. I come from a very musical family too so they’ve definitely inspired me as a musician. My brother plays cello on the album too. I think all my influences reflect throughout each song on the album and you can definitely hear a lot of different sounds in them. There’s a bit of jazz, folk, rock, everything really. I get bored sticking to one style! T remember the first proper gig I went to was the Chilis in the Millennium stadium in 2004, with James Brown supporting. Blink 182 was another gig I saw – I remembered I actually crowd surfed in that gig! DEAN: I don’t suspect there’ll be any crowd surfing at your gigs? MADDIE: We’ll see about that – I do have some very funny friends. I would consider doing it in the middle of a performance, but I’d be too scared to drop my guitar! It’s very precious to me. DEAN: Is there a lot of artists in the current music scene in Cardiff who you look up to or are good friends with? MADDIE: There’s a lot of talented artists in the Cardiff scene who I really get on with. I’m good friends with a band called Albatross Archive who are actually on my album. The two acts who will be supporting me at my album launch are Kymo and Harri Davies, and they’re both insanely good. On the subject of crowd surfing, Harri actually crowd surfed at a festival I saw him perform at! DEAN: Over the past year, you’ve been very busy on the gig and festival circuit – playing the likes of Swn Festival and Glastonbury, and winning Cardiff’s Big Gig competition. Through that, do you really feel you’ve come into your own as a live performer? MADDIE: I’ve enjoyed the experience of it and it’s a big lea from when I started out on the open mic circuit. I really want to be playing festivals more regularly now because I see myself more as a festival performer, in that I really enjoy the atmosphere that kind of stage brings. Prior to being a solo artist, I was actually in a punk rock band. I remember the first time I properly performed solo was at a festival after party where I played REM ‘Everybody Hurts’, and I managed to make my mum cry! I didn’t play gigs on my own that regularly until after I came back home from university. When I came back, I just thought to myself that I didn’t want to get any other job other than in music. DEAN: How do you approach writing songs? MADDIE: I rarely ever write a whole lyric and set it to music. I normally just mess around on the guitar and then when I come up a riff, I think of other parts to go with it, and then just start singing words to it that don’t make sense, then adding words that do make sense, and eventually it just all flows together. It’d be different for me to try writing from a lyric first; even weirder to write the music for someone else’s lyrics. DEAN: Would you ever consider writing for other artists? MADDIE: I’d like to at some point, and there’s a lot of artists I know in Cardiff who I regularly meet up with at various local gigs and festivals, and we always say to each other we should write or jam together. It hasn’t happened yet, but it will – maybe there’s a collaborations album to come from me! DEAN: Are you planning any collaborations soon? MADDIE: Albatross Archive played on my album so to an extent, I’ve already collaborated with them but would love to work with them even more. Whenever I’ve done a launch gig for my EP’s, I’ve always made sure me and all the support acts are performing together rather than being just one act after the other. DEAN: The music scene in Cardiff is very exciting at the moment and Swn Festival just enjoyed another successful year even despite its downgrade to a one-day event. Do you think it’s just the start of bigger things for the Welsh scene? MADDIE: I think the great thing about Welsh music festivals such as Swn is that they make it their mission to include as many artists from the local scene as they can. I think if the Welsh music scene really wants to enjoy more of the success it merits, then there really needs to be more, bigger specialist music venues in Cardiff and elsewhere in Wales. There’s a lot of great, independent venues that are good for launching the careers of artists who are starting out, but far too small to accommodate the fanbases for more established stars. Here, the next step up from that is Cardiff Motorpoint Arena which is huge, so there needs to be an in-between type of venue. I think it’s a major factor in why so many artists tend to miss Cardiff from their touring map, because the venues here are either too big or small for their amount of fans.